> It’s now Official- We have the BEST LONDON HONEY! 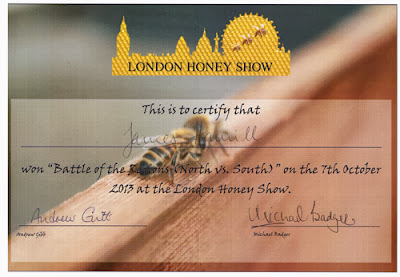 The Hive Honey Shop just won the Best London Honey Award at the 2013 London Honey Show. This years, ‘Battle of the Regions’ took place on Monday 7th of October at the Lancaster London Hotel. Honeys from all over London took part. The best thing about this award is that it was judged and voted by the public. A large tester table was set up in the middle of the hall and the public were invited to taste test all the honeys and vote for the one they felt was the very best. As part of the show there were timed guest ‘Bee Expert’ speakers, trade stands and interesting exhibits of rare antique beehives from around the world. At the end of the show when the winner was revealed Jo Hemesley, the organiser of the show, announced that the winning London honey won by, “a landslide”. James Hamill of The Hive Honey Shop stepped up onto the stage to received their framed 2013 award certificate. The crowd called out to James receiving the award on behalf of The Hive Honey Shop, “Where can we buy it from! !” James replied- The Hive Honey Shop in London!